Arctic Oil refers to any oil exploration or production that occurs in the far North. It is referred to as unconventional because of the complications associated with operating in the extreme weather conditions and offshore. Arctic Oil is usually defined as oil reserves found in Arctic-like conditions, characterized by ice, permafrost, and extreme temperatures. Arctic Oil can be found both on and offshore but the vast majority (an estimated 84%) is offshore, in the Arctic's shallow shelf seas U.S. Geological Survey (2008). Circum-Arctic Resource Appraisal: Estimates of Undiscovered Oil and Gas North of Arctic Circle. USGS. Retried May 25 2014, from http://pubs.usgs.gov/fs/2008/3049/fs2008-3049.pdf U.S. Geological Survey (2008). Circum-Arctic Resource Appraisal: Estimates of Undiscovered Oil and Gas North of Arctic Circle. USGS. Retried May 25 2014, from http://pubs.usgs.gov/fs/2008/3049/fs2008-3049.pdf U.S. Geological Survey (2008). Circum-Arctic Resource Appraisal: Estimates of Undiscovered Oil and Gas North of Arctic Circle. USGS. Retried May 25 2014, from http://pubs.usgs.gov/fs/2008/3049/fs2008-3049.pdf U.S. Geological Survey (2008). Circum-Arctic Resource Appraisal: Estimates of Undiscovered Oil and Gas North of Arctic Circle. USGS. Retried May 25 2014, from http://pubs.usgs.gov/fs/2008/3049/fs2008-3049.pdf . Oil produced in this region is normally considered unconventional because of the production techniques that must be employed to overcome the extreme environmental conditions Gosden, E (30 Sep 2012).Overcoming Challenges of Arctic Oil Drilling. Telegraph. Retrieved May 25 2014, from http://www.telegraph.co.uk/finance/newsbysector/energy/9577117/Overcoming-challenges-of-Arctic-oil-drilling.html Gosden, E (30 Sep 2012).Overcoming Challenges of Arctic Oil Drilling. Telegraph. Retrieved May 25 2014, from http://www.telegraph.co.uk/finance/newsbysector/energy/9577117/Overcoming-challenges-of-Arctic-oil-drilling.html Gosden, E (30 Sep 2012).Overcoming Challenges of Arctic Oil Drilling. Telegraph. Retrieved May 25 2014, from http://www.telegraph.co.uk/finance/newsbysector/energy/9577117/Overcoming-challenges-of-Arctic-oil-drilling.html Gosden, E (30 Sep 2012).Overcoming Challenges of Arctic Oil Drilling. Telegraph. Retrieved May 25 2014, from http://www.telegraph.co.uk/finance/newsbysector/energy/9577117/Overcoming-challenges-of-Arctic-oil-drilling.html . However, the produced oil has mostly conventional properties. Oil in this region is produced using mobile drilling rigs, similar to those used in offshore oil production. These rigs are reinforced for safety and have specially shaped legs to stand up against ice floes. The Arctic is estimated to be home to 13% of the world’s undiscovered oil reserves, meaning that the region may contain as many as 90 billion barrels of oil Mouawad, J (24 July 2008). Oil Survey Says Arctic Has Riches. The New York Times. Retrieved May 25 2014, from http://www.nytimes.com/2008/07/24/business/24arctic.html?_r=1& Mouawad, J (24 July 2008). Oil Survey Says Arctic Has Riches. The New York Times. Retrieved May 25 2014, from http://www.nytimes.com/2008/07/24/business/24arctic.html?_r=1& Mouawad, J (24 July 2008). Oil Survey Says Arctic Has Riches. The New York Times. Retrieved May 25 2014, from http://www.nytimes.com/2008/07/24/business/24arctic.html?_r=1& Mouawad, J (24 July 2008). Oil Survey Says Arctic Has Riches. The New York Times. Retrieved May 25 2014, from http://www.nytimes.com/2008/07/24/business/24arctic.html?_r=1& . The main countries involved in Arctic resource production are Canada, Denmark, Norway, Russia, and the United States. More than two-thirds of the current producing fields are located in Western Siberia, Russia Fillingham, Z (8 Apr 2009). Arctic Ownership Claims. Geopolitical Monitor. Retrieved May 26 2014, from http://www.geopoliticalmonitor.com/arctic-ownership-claims-01990/ Fillingham, Z (8 Apr 2009). Arctic Ownership Claims. Geopolitical Monitor. Retrieved May 26 2014, from http://www.geopoliticalmonitor.com/arctic-ownership-claims-01990/ Fillingham, Z (8 Apr 2009). Arctic Ownership Claims. Geopolitical Monitor. Retrieved May 26 2014, from http://www.geopoliticalmonitor.com/arctic-ownership-claims-01990/ Fillingham, Z (8 Apr 2009). Arctic Ownership Claims. Geopolitical Monitor. Retrieved May 26 2014, from http://www.geopoliticalmonitor.com/arctic-ownership-claims-01990/  Radyuhin, V (21 Dec 2013). Russia begins oil production in the Arctic. The Hindu. Retrieved May 28 2014, from http://www.thehindu.com/news/international/world/russia-begins-oil-production-in-the-arctic/article5487104.ece Radyuhin, V (21 Dec 2013). 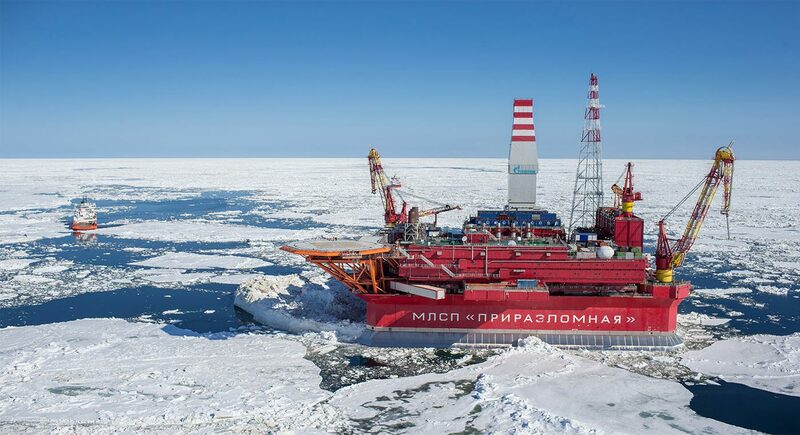 Russia begins oil production in the Arctic. The Hindu. Retrieved May 28 2014, from http://www.thehindu.com/news/international/world/russia-begins-oil-production-in-the-arctic/article5487104.ece Radyuhin, V (21 Dec 2013). Russia begins oil production in the Arctic. The Hindu. Retrieved May 28 2014, from http://www.thehindu.com/news/international/world/russia-begins-oil-production-in-the-arctic/article5487104.ece Radyuhin, V (21 Dec 2013). Russia begins oil production in the Arctic. The Hindu. Retrieved May 28 2014, from http://www.thehindu.com/news/international/world/russia-begins-oil-production-in-the-arctic/article5487104.ece . With increased global temperatures causing melting of the glaciers and improved technologies, many companies are looking to further their production efforts in this region. It is believed that an estimated $100 billion could be invested in the Arctic over the next decade Cowling, J (21 Aug 2011). Arctic oil expoloration: Potential riches and problems. BBC. Retrieved May 25 2014, from http://www.bbc.com/news/business-14728856 Cowling, J (21 Aug 2011). Arctic oil expoloration: Potential riches and problems. BBC. Retrieved May 25 2014, from http://www.bbc.com/news/business-14728856 Cowling, J (21 Aug 2011). Arctic oil expoloration: Potential riches and problems. BBC. Retrieved May 25 2014, from http://www.bbc.com/news/business-14728856 Cowling, J (21 Aug 2011). Arctic oil expoloration: Potential riches and problems. BBC. Retrieved May 25 2014, from http://www.bbc.com/news/business-14728856 . The Arctic is one of the world’s most fragile biological environments on the planet and therefore natural resource production in this area is met with concern and criticism. Drilling for oil in the Arctic has unique challenges and difficulties. In certain areas of the Arctic, drilling can cause toxins, such as arsenic, mercury, and lead, to be released into ocean waters and threaten marine animals in surrounding areas. There is also an increased risk of oil spills due to factors such as a lack of natural light, extreme cold, moving ice floes, high wind and low visibility. The remoteness of drilling locations and difficulty navigating the harsh environmental conditions make spill response operations extremely difficult, if not impossible. Sorry, we do not yet have a video specifically for Conventional Oil. We are adding new videos to StudentEnergy.org weekly, but in the meantime check out this video on Oil. Offshore Oil refers to oil production in the beds of oceans and lakes. "Deepwater" refers to production where water depths are greater than 1000 metres. Drilling refers to the process of boring a hole through soil and rock to access geologic reservoirs that contain oil and gas.